The dogs and I are over Bramshill, listening to the ducks telling each other off on the carp ponds. I’m sat on the stile, and I can smell great wafts of wild honeysuckle and sweet grass. I’m eating sun-warmed elderberries, pips and all, and watching a small brown bird inspect the rash of berries on the hawthorn bushes. It’s almost six in the evening, golden time, and I’ve abandoned the washing up from the children’s tea to run away, up the hill. As I watch, a fat Bumble Bee arrives to harvest the honeysuckle, and I creep up to take a photograph. Pants comes to see what I’m doing, then barks hysterically at the bee. I laugh and the bee retracts and reverses, louder than ever. Pants jumps away, then sits down as if in great trouble. The bee visits another flower, and the silly dog sits and trembles. Dora arrives to see what the fuss is about, then regards him with disgust. We walk on, through the spinney and up through the stubble field, and I wonder about bees, and whether it’s true that their pollen can support our production of white blood cells. How does that work though? How do you get the pollen from the bee before it seals it into a comb? I really hope it happens without involving the death of the bee. At the top of the hill, I pause, looking over one of my favourite views. Everything’s tipped with gold in the evening light; even the fields that have been drilled have a richness to the brown of their earth. We walk on, Dora at my heels, Pants running away from his shadow ahead. 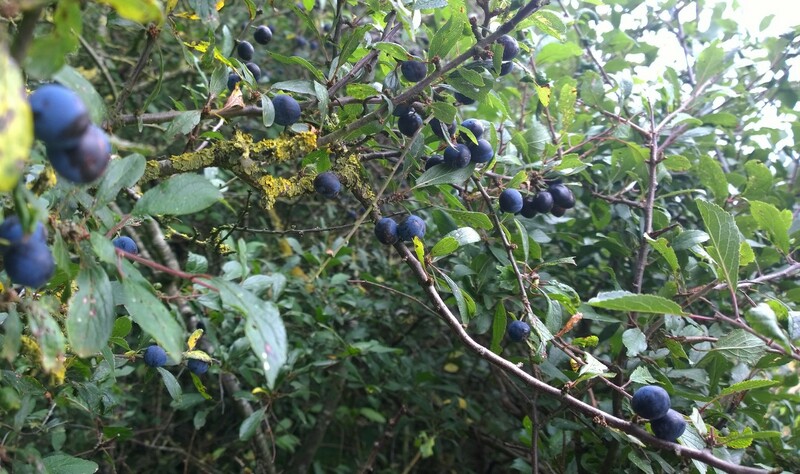 I climb the stile leading to Clump, and notice the sloes – the most I’ve ever seen in this spot. I think joyous thoughts of gin, and hurry-up hurry-up to the first cold snap. As I turn for home I remember the pasta pans and chopping boards from the children’s tea. The ironing mountain and the bath with the grubby stripe. The new school uniform, still nameless, still heaped on the armchair. But then I think of my saved Bombay Sapphire bottles, sat in dusty ranks, just waiting, waiting, for the sloes with that first kiss of frost. First up, you need to find your sloes. This year in the UK it has been a bumper harvest for these autumnal berries and the trees are aching with fruit. If you can pop the berries easily between your finger and thumb, they’re ripe. Pick enough to half-fill the bottle of your choice, but before you put them inside, stick them in the freezer overnight. This will simulate the first frost and split the skin on your berries, allowing them to release their natural sweetness. After sterilising your airtight bottle, half fill it with the frozen fruit and top up with gin – a good gin please, as cheap ones aren’t very nice and will often ruin all of your hard work. Add a couple of spoonfuls of caster sugar and shake for a minute. Lay on its side out of direct sunlight and twist it 180 degrees every other day for two months. Then taste it; if you think you need it sweeter then make a simple sugar syrup. Do this by dissolving equal parts water and sugar in a saucepan over a low heat and allow to cool; add to your liking. Serve on a crisp winter’s day lunchtime as an aperitif. We shall have to have a tasting come Christmas, I’m going to try Jamie’s way as it does save all that pricking!